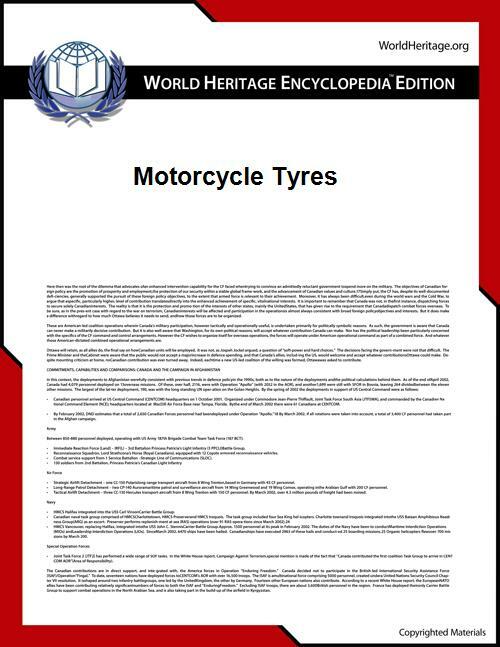 Motorcycle tyres provide the only contact with the ground, via the contact patch under normal conditions, and so have a very large influence over motorcycle handling characteristics. Motorcycle tyres have a round cross section to facilitate the leaning necessary when a motorcycle turns. The unworn portion of tyre near the outer edge may be referred to as chicken strips. Motorcycles mainly use pneumatic tyres. However, in some cases where punctures are common (some enduros), the tyres are filled with a "mousse" which is unpunctureable. Both types of tyre come in many configurations. Motorcycle tyres are available for many different applications, including: Sport, Sport Touring, Touring, Cruiser, Scooter, On/Off Road, Dual-Sport, Enduro, Motocross and Racing. There are tyres designed for dirtbikes, touring, sport and cruiser bikes. Sport/performance tyres provide amazing grip but may last 1,000 miles (1,600 km) or less. Cruiser and "sport touring" tyres try to find the best compromise between grip and durability. There is also a type of tyre developed specifically for racing. These tyres offer the highest of levels of grip for cornering. Because of the high temperatures at which these tyres typically operate, use on the street is unsafe because the tyres will typically not reach optimum temperature before a rider arrives at the destination, thus providing almost no grip en route. In racing situations, racing tyres would normally be brought up to temperature in advance by the use of tyre warmers. Sport Touring tyres are generally not used for high cornering loads, but for long straights, good for riding across the country. Sport Street tyres are for aggressive street riders that spend most of their time carving corners on public roadways. These tyres do not have a long life, but in turn have better traction in high speed cornering. Street and sport street tyres have good traction even when cold, but when warmed too much, can actually lose traction as their internal temperature increases. Track or Slick tyres are for track days or races. They may have more of a triangular profile, which in turn gives a larger contact patch while leaned over. These tyres are not recommended for the street by manufactures, and are known to have a shorter life on the street. Due to the triangulation of the tyre, there will be less contact patch in the centre, causing the tyre to develop a flat spot quicker when used to ride on straightaways for long periods of time and have no tread so they lose almost all grip in the wet. Racing slicks are always made of a softer rubber compound and do not provide as much traction as street tyres until warmed to a higher internal temperature than street tyres normally operate at. Most street riding will not put a sufficient amount of friction on the tyre to maintain the slick's optimal tyre temperature, especially in colder climates and in spring and fall. Off road tyres have knobbly, deep treads for maximum grip on loose dirt, mud, sand, or gravel; such tyres tend to be less stable on paved surfaces. Touring tyres are usually made of harder rubber for greater durability. They may last longer, but they tend to provide less outright grip than sports tyres at optimal operating temperatures. The tradeoff is that touring tyres typically offer more grip at lower temperatures, meaning they can be more suitable for riding in cold or winter conditions whereas a sport tyre may never reach the optimal operating temperature. There are several properties of motorcycle tyres that influence the performance, handling, and stability of a motorcycle. Rolling resistance is the resistance that occurs when a tyre rolls on a flat surface. The rolling resistance coefficients of motorcycle tyres are about 0.02. It tends to increase with forward speed and decrease as inflation pressures increase. Cornering force is the lateral (i.e. parallel to the road surface) force produced by a vehicle tyre during cornering. Cornering force coefficients of motorcycle tyres tends to decrease with increased vertical load, increased inflation pressure, and increased temperature. Camber thrust is the force generated perpendicular to the direction of travel of a rolling tyre due to its camber angle and finite contact patch. Pneumatic trail is a trail-like effect generated by compliant tyres rolling on a hard surface and subject to side loads, as in a turn. It is the distance that the resultant cornering force of side-slip occurs behind the geometric center of the contact patch. Relaxation length describes the delay between when a slip angle is introduced and when the cornering force reaches its steady-state value. 3 digit number: The "nominal section width" of the tyre in millimetres; the widest point from both outer edges. /: Slash character for character separation. 2 or 3 digit number: The "aspect ratio" of the sidewall height to the total width of the tyre, as a percentage. 2 digit number: Diameter in inches of the wheel that the tyre is designed to fit.